Tid bits & sound bites from Jersey Devil & the CrossFit community. 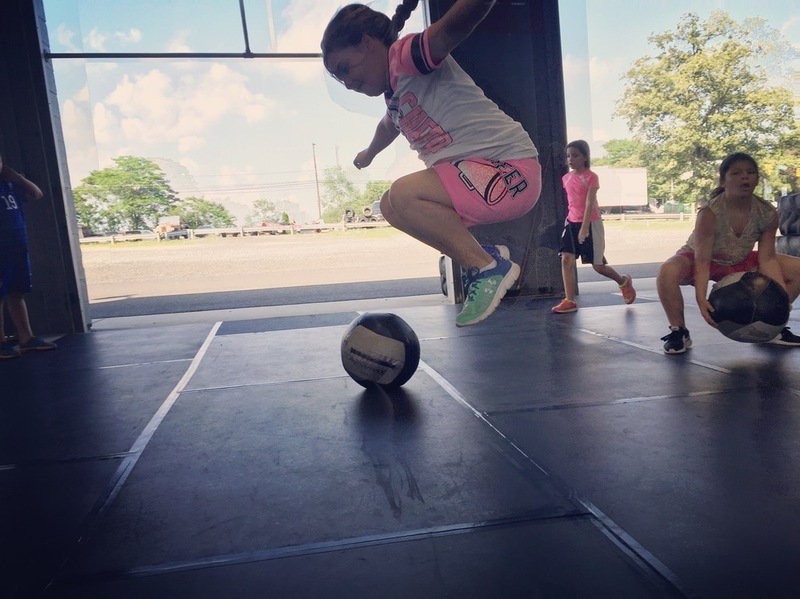 Jersey Devil CrossFit Kids: Blurring the lines between work & play every day. Jonathan is one of our amazing CrossFit Kids. He is hard working and determined. No workout is too long or too tough for this guy. Jonathan started out with our normal CrossFit Kids class, but when him and his mom approached us for some extra time in the gym, we knew he'd be fine jumping in with our CrossFit Boot Camp Classes. Even with his busy school & sports schedule he still finds time to get in the gym... and when he can't, we've heard he's been known to make up his own workouts to do at home! We love Jonathan's enthusiasm for learning & trying new things in the gym. We can see him getting stronger and faster. Just the other night he did over 100 kettlebell swings with the same weight he struggled to do sets of 10 with when he started out with us! He has all the characteristics of a great athlete and we can't wait to see what he does! Keep on pushing Jonathan! Jersey Devil CrossFit's November Night Out Is One You're Not Going to Want to Miss! We've teamed up with SaDee's Clothing Boutique right in downtown Hammonton to get our members an exclusive cocktail hour & 25% off all Men's and Women's Apparel on November 5th from 5-7pm! We'll have a few drinks & get our shop on before a dinner at Annata's! All Jersey Devil CrossFit and CrossFit Kids Members are welcomed! The 3rd Annual Blueberry Crossing Fall Fest is almost here! Jersey Devil CrossFit is going to be hanging out at Hammonton's Fall Fest on September 10th! We'll be talking about our CrossFit & CrossFit Kids programs, having a few friendly competitions going, playing some games, & more! Make sure to stop by, get your name in our raffle, & support our uptown businesses! A huge thank you to everyone who participated, spread the word, & donated to our WOD For Water Event this past Saturday! We had an amazing time raising awareness for this incredible cause & working out with everyone! We ended up raising just over $1200! If you'd like to give, there's still time. Go to www.wodforwater.com today! That's right, June is here & with a new month comes a new CrossFit Kids Skill of the Month! Each month we have a different focus in our crossfit kids classes. In April we focused on Pushing (planks, push ups, push presses, etc.) and in May we got our pull on (ring rows, pull ups, negatives, rope climbs, & deadlifts)! Now that June is finally here, we'll be focusing on The Squat! We'll be jumping into air squats, front squats, thrusters, & more! We're excited for June, hope you are too! Together we've raised almost $700 already! Teams of 4 must carry the jug while running, each person takes a turn. Split up reps for the rest of the exercises and the person doing the work uses the can. If done with just a partner (team of 2) cut the reps to 50 per exercise. Your one time participation in our event will change their lives forever. I was sitting in my office today, reading through my Food and Nutrition Magazine, when I came across a series of articles about bone health & osteoporosis prevention. You'd think the articles would be littered with fruit & vegetable recommendations and images of milk mustaches & calcium supplements, but instead of a huge glass of milk on the page there was a picture of a kettlebell. The main takeaway of that article: Weight Bearing Exercise is Key to Building AND Maintaining Strong Bones. Like muscles, bones are living tissue, and they require stress to stimulate growth and maintain integrity. Just as consuming extra protein without exercising will not result in strong muscles, consuming calcium without exercising will not result in optimal bone mass. Exercise positively effects bone health in more than one way and at all ages. Weight bearing exercise stimulates mineral uptake in children and adults, which is great because although we don't usually think about fractures and thinning bones affecting us until we are well into our sixties, these conditions are directly influenced by the choices we make decades earlier. The article went on to recommend & categorize different kinds of exercise including high and low impact weight bearing exercises, strength building exercises, and balance/posture/functional exercises. The cool thing here is that CrossFit can fall into ALL of those categories. All our WODS include some sort of weight bearing exercise on most days, sprinkled with strength building exercises, and functional movements left & right! So not only are we all making muscular gainz, but we're also making bone health gainz every day. You can read the whole article on bone health & weight bearing exercise here.